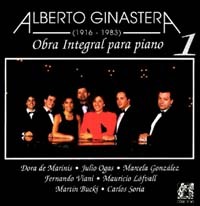 The Argentinian composer Alberto Ginastera (1916-1983) is widely regarded as one of the most important and original South American composer of the 20th century. His attractive output for piano skillfully combines folk Argentine rhythms and colors with modern composing techniques. Exhilarating rhythmic energy, captivating lyricism and hallucinatory atmosphere are some of the characteristics of his musical style. Fundacion Ostinato has produced recordings of his complete works for piano solo, and the world-premiere of his TWO PIANO CONCERTI in one CD. Click on CDs for information. Alberto Ginastera, Argentine composer, died on June 25, 1983. He had been born in Buenos Aires on April 11, 1916, the son of Catalonian and Italian immigrants devoted to agriculture, trade, and crafts. He began his music studies at a very early age. When he was 12 he entered the Williams Conservatory. In 1934 he got his first award from "El Unisono" Association. Many important awards followed throughout his life, such as "Argentine School Song" Award, four national prizes, three municipal prizes , Bicentennial Cinzano Award, National Fund for the Arts Annual Award, etc. In 1942 Ginastera received a grant from the Guggenheim Foundation to visit the United States, but he postponed his trip until 1945. This journey was to highly influence his future works On his return to Buenos Aires he and other Argentine composers founded the Composers' League. He also founded the La Plata Music and Performing Arts Conservatory and the Latin American Center for Advanced Music Studies at the Di Tella Institute, in Buenos Aires. As to his numerous academic activities, he was a Member of the Conseil Intemational de la Musique (UNESCO), Member of the National Academy of Fine Arts in Argentina, Honorary Member of the American Academy of Arts and Sciences, Honorary Member of the School of Music Sciences and Arts (Chile Nation al University), Member of the Chilean Composers Association, and Honorary Member of the Brazilian Music Academy. He was the Dean and Honorary Professor at the School of Music Sciences and Arts (Argentine Catholic University), and Professor at the La Plata University. In 1968 Yale University awarded him an honorary doctorate. 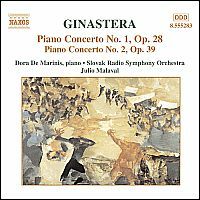 Ginastera is the foremost representative of musical nationalism. His oeuvre covers all music genres. He composed three operas, five ballets, orchestra works, one harp concerto, two piano concertos, two cello concertos, one violin concerto, two choir works, cantatas, works for piano, voice, organ, flute, guitar, and chamber music. He also composed music for the theater and for eleven movies. His total repertoire contains fifty five works, but being perfectionist and meticulous as he was, many of them were withdrawn from his catalogue. 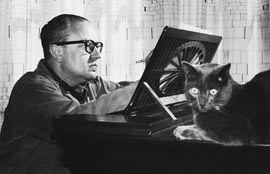 As to Ginastera's style, his oeuvre can be divided into three periods that he called Objective Nationalism, Subjective Nationalism, and Neo-Expressionism. His early works belong to the first period. 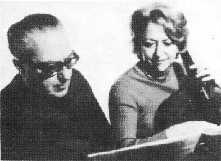 Ginastera uses Argentine folk and popular elements and introduces them in a straight forward manner. He is also influenced by Stravinsky and, in a lesser degree, by Bartok and Falla. Two of his most famous works belong to this period, Argentine Dances op. 2 for piano, and Estancia (Ballet). From 1948 on, the time of his stay in the US, he starts to use more advanced composing techniques. He naturally turns to Subjective Nationalism, with no revolutionary positions. He does away with popular traditional elements, although he continues to use them mainly for symbolic purposes. He never gives up Argentine traditions. He uses rhythmic contrasts and has a deep, tense feeling. Melody is still important, as well and contrasts between tension and relaxation. The most important works belonging to this period are Pampeana No. 3 for orchestra and his Piano Sonata No. 1, one of the staples in the repertoire of today's pianists. His Neo-Expressionist period starts approximately in 1958. In Ginastera's own words, "There are no more folk melodic or rhythmic cells, nor is there any symbolism. There are, however, constant Argentine elements, such as strong, obsessive rhythms, meditative adagios suggesting the quietness of the Pampas; magic, mysterious sounds reminding the cryptic nature of the country. Several important works belong to this period, such as his much criticized opera Bomarzo, his Popul Vuh for orchestra, and his Concerto No. 2 for Cello and orchestra.